Rockies pitcher Josh Outman on the ground to Outman who threw to shortstop Troy Tulowitzki at second to first baseman Todd Helton to complete the double play at first. Replays indicate Tulowitzki's left foot remained on second base while he gained possession of the baseball, the call was correct. At the time of the ejection, the Rockies were leading, 6-3. The Rockies ultimately won the contest, 6-4. 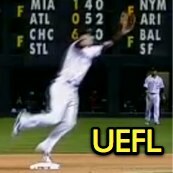 This is Adrian Johnson (80)'s second ejection of the 2013 MLB season. Adrian Johnson now has 8 points in the UEFL (4 + 2 + 2 = 8). Crew Chief Fieldin Culbreth now has 2 points in the UEFL's Crew Division (1 Previous + 1 Correct Call = 2). This is the 127th ejection of the 2013 MLB season. This is the 61st Manager ejection of 2013. This is the Pirates' 8th ejection of 2013, 1st in the NL Central (PIT 8; STL 5; CHC 4; MIL 3; CIN 0). This is Clint Hurdle's MLB-leading 5th ejection of 2013 and first since July 25 (Laz Diaz; QOC = Correct). This is Adrian Johnson's first ejection since May 28, 2013 (Terry Collins; QOC = Correct). Clint Hurdles wild rabbit...... staying in baseball games. "It appears closer with the Super-Mo." nope i never accept announcers to say they were wrong they open there mouth before they speak. I think we have found Bobby Cox's successor. Hurdle's act is getting old with the umps now. The graphic UEFL posted above is not clear of ANYTHING. The replay makes it appear he is off the bag. Very similar play happened in Cardinals game the other night. The umpires need to quit this "neighborhood" call. they never said it was a neighborhood play, In fact that really is not going to be happen with the new umpire coming up. This isn't even a so-called "neighborhoid play" situation. Hurdle is really starting to get on my nerves, honestly. And from the slow-mo camera just when the ball impacts the glove. And what about the 29 frames in-between? In the past I have tried opening my mouth only after speaking. I have never been successful. No protest shall ever be permitted on judgment decisions by the umpire. (a) Any umpire’s decision which involves judgment, such as, but not limited to, whether a batted ball is fair or foul, whether a pitch is a strike or a ball, or whether a runner is safe or out, is final. No player, manager, coach or substitute shall object to any such judgment decisions. MIchael is challenging the UEFL ruling of Correct, which he is allowed to do. He is not attempting to protest the outcome of the game. It was pretty close but the best part was AJ giving it Hurdle. Can anyone point me to the video of this play? The link that is usually provided is not active. Thanks. After review, the Original Ruling has been affirmed in a 5-0-0 decision by the UEFL Appeals Board. Four Appeals Board members voted to confirm the Original Ruling while one elected to uphold it. Confirm. The picture is certainly clear enough for me. That's a good piece of umpiring, actually looking at the bag at the moment the ball was caught. To the naked eye, it certainly looked like the fielder was off the bag, but then again, that's why they hire umpires. Confirm. F6 secured possession of the baseball while in contact with second base prior to R1's arrival. Therefore, the Board affirms the Original Ruling.